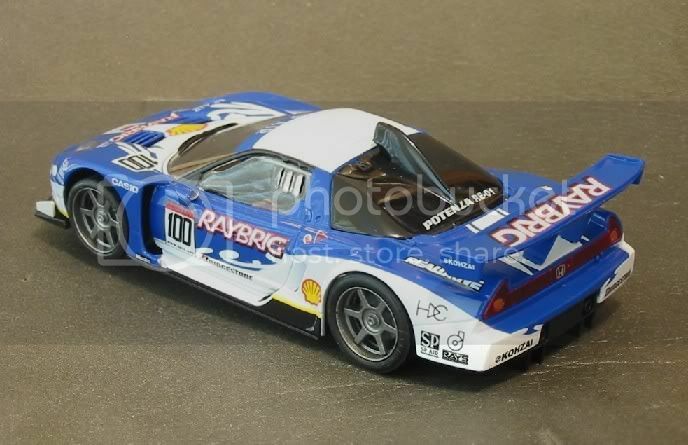 Not a new model on the block but seeing as the Japanese Autobac Super Gt series is shaping up to be a perennial along side such classes as WTCC, FIA GT championship and A1 GP then it gfoes without saying that there are going t be many more races, many more seasons and any more liveries to come. So, rather than focus on the latest livery I have decided to do a semi retro on the Ninco Raybrig Honda. JGTC or Super GT to give it its correct title, has been running for some years now in Japan and with the expansion of media coverage and the attraction of some international names it is, like WTCC and FIA World GT, now being raced at some of the leading tracks around the world. The bulk of the racing is still at home in Japan though and the bulk of its attraction is also still in Japan. Unless you have unlimited satellite facilities it is unlikely you will see a regular televising of this series, unless you live in Japan, of course. There are two groups to the Super GT class. The premier class is the GT500 class based around motors producing 500 hp and the other is the GT350 class. The GT500 has a limited number of makes entered although there are a good few teams so as a spectator sport you would need to affiliate yourself to a team in order to appreciate it more. The main makes involved have been Honda NSX’s, Toyota Supra’s, Nissan Z33’s and Lexus SC430 although the Toyotas have been replaced by the Lexus’ for 2007 The 350 class races a lesser rank of cars and contest their own series , a bit like a mini Le Mans really, but I am focusing on the Honda NSX by Ninco. The model externally is quite eye catching in its blue and white livery and looking over it gives you an idea of its quality and finish. 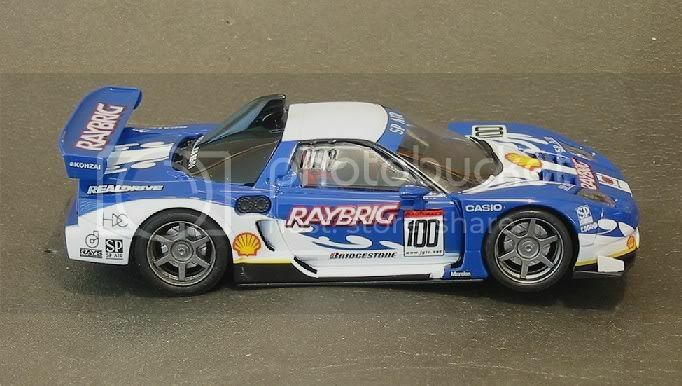 The body work is well detailed but lacks that fine detail that the Chinese made Scalextric cars have. Although good by most standards, not quite that same crispness in detail and tampo and everything is covered in a rather heavy clear lacquer coat, except for under the rear wing where it seems to have had a dust over leaving a very ‘orange peely’ patch under it, but then Ninco seem to be aimed at the more serious racer rather than the study shelf! The door mirrors look very sturdy and Ninco don’t yet subscribe to the flexible mirror group and I suspect that regardless of their strength of manufacture, the door mirrors are doomed to become a statistic not too far down the road!. The wing is probably mounted a bit stronger than some of the other model but it is still vulnerable. This will be removed for racing. A steady hand and a hot soldering iron held beneath the rear wing heat welds but NOT touching will allow me to carefully pull them through the body, there by making the wing a removable object and free from harm!! Talking of removable objects, there isn’t much that is going to become a deslot victim except for two tiny aerofoils mounted on the front air dam. Well, one of these fell off before it made the track so the other was removed (just a tug!) and both were sticky taped to the display case to be refitted in the model’s twilight years. Once again there is a half driver’s tray as is the norm with most Ninco models. I don’t have a problem with that and wouldn’t mark the model down because of it. 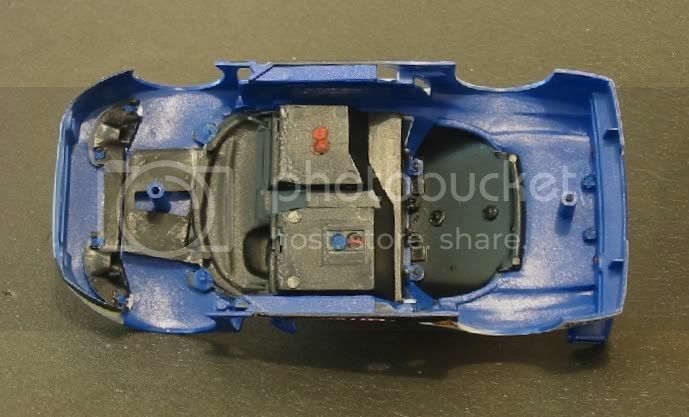 Bearing in mind that this is a slot car and not a diecast, there probably won’t be too much time oggling the interior. Number one, there aren’t any opening doors to oggle through and number two, there isn’t a great deal to see through minimal side windows! The wheels and tyres are surprisingly round and free from eccentricity. Ninco are renown for having at least something out of round up the back but this time they seem to have cracked it!! Tyres too, took little sanding to get tem into some sort of shape, thereby retaining vital tenths of millimetres of tyre depth rather than half of it ending up on the floor! A quick test of the wheel security also reveals that potentially, ALL the wheels are likely to stay ON after a good race session, truly!! Not a loose or slipping one amongst them. Underneath the model, all is Ninco. I’m still not fully convinced by angle winders. 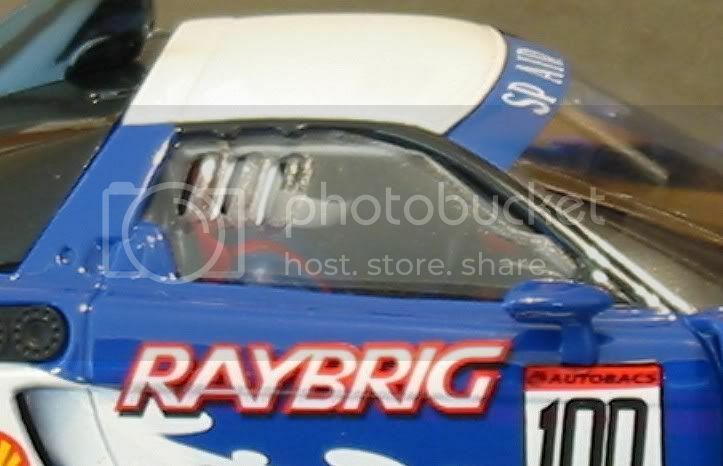 Most of my racing is non magnet and I feel that I ought to do something about the fact that most of the NC5 motor is in the left hand side of the car?? The chassis too, has less of itself where the spur gear recess is. I just get the feeling this car is heavier one side?? The other thing too, is the fact that a huge piece of rear chassis is missing where the motor sticks through. Ninco’s weakness is in the chassis where the wheel wells come close to the motor. Even though there is extra deep webbing in the chassis moulding between axle and motor, there is still bend in the chassis, and guess what, you’ve guessed, the d**N MOTOR IS LOOSE. After all these years the motors still come loose out of the box, WHEN is Mr Ninco going to do something about this. The whole area around the rear of this model is a potential disaster area and I have already had feedback about this model and its weak chassis from fellow slot racers. Moving on, we have the guide up front, one of Ninco’s trademark spring-loaded guides. I don’t mind these but they do need work from new. The braids will be changed to tinned braids and the guide, which has a suspect amount of front / back slop, will get a thin piece of plastic card stuck to the top side of the guide shoe to encourage it to point up at the front instead of down and run on the front edge of the braids!! One of the chassis’ redeeming features is that it has only two retaining screws, Saints preserve us! Taking these two screws out and lifting the body off the chassis reveals Mr Ninco’s tried and tested chassis layout. I must admit that it’s been a while since I looked inside a modern Ninco car and I was pleased to see they now cross brace the chassis inside with extra fillet type mouldings. 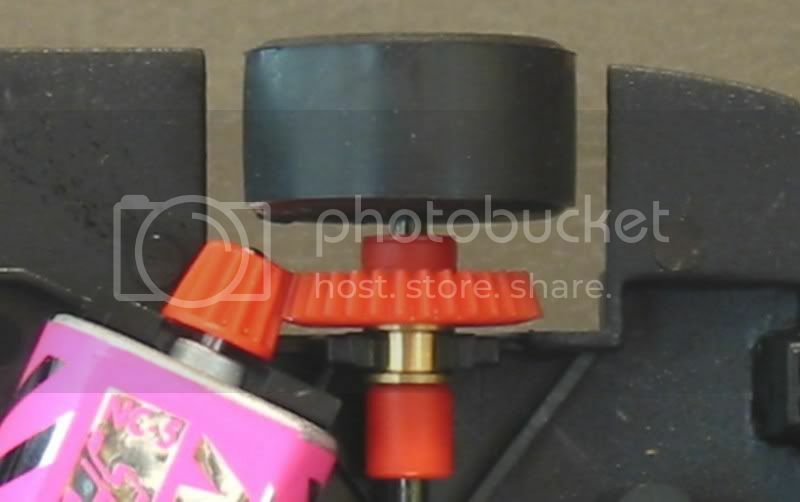 This has to be a plus even though it will reduce the effect of allowing the magnet closer to the rails when the chassis screws are backed off a little. Ninco needs all the help it can get in the magnet department. The front axle is very snug. It runs in the chassis and unless you keep it lubed, a couple of years or less down the road will see it wear through the mounts and become a bit of a loose cannon as do most of its predecessors. It’s a good wide axle though and a good wide chassis to boot! Moving back is the button magnet. Nothing new here. It doesn’t feel any more powerful than previous magnets either. 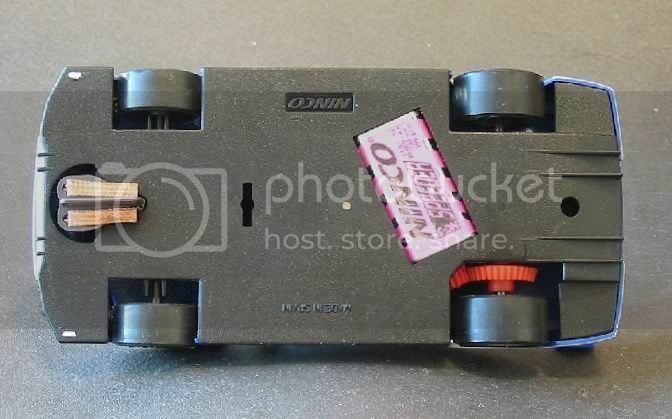 If you ever want to increase the magnetic downforce of a Ninco model, it’s as simple as placing another button magnet on top of the existing one. No glue, no nothing. The flux density will hold it in place even in the biggest of crashes. One worrying thing is the proximity of the bare wires beside the motor?? Not happy Jan! Would a severe ‘T’ boning in a hard race cause these to touch?? Not happy Jan! I am told the little green doobrie is an inductance and is part of the RI measures for the model. In the past, I have desoldered them and fixed the lead wire direct to the motor. This time, as I have some telly addict neighbours, I am going to solder a wire bridge across the little beggar. This should remove any doubt about drop in power and I might even retain a vestige of RI ability! No? well it was just a thought! Moving back I see the rear axle is a good fit in its mounts. Side play is minimal and gear mesh is sound, although I did slide the pinion along the armature shaft a little to reduce backlash in the gears to a minimum. I am told the axle mounts in the chassis are a weak point to so I’ll be monitoring this over the months. Rear hubs and tyres, as mentioned before, are good and I am not expecting any nasty surprises in that department. Underneath the body is simple and all the heat welds look sound even if one or two are a bit over done. The body feels quite light but when tapped it doesn’t rattle so I’m expecting a quiet model on the track too. So it’s a pretty straight forward layout and no surprises. Basic, well proven Ninco and, all going well, it should be able to out run the Scaley peril on board tracks, or plastic tracks with long straights. 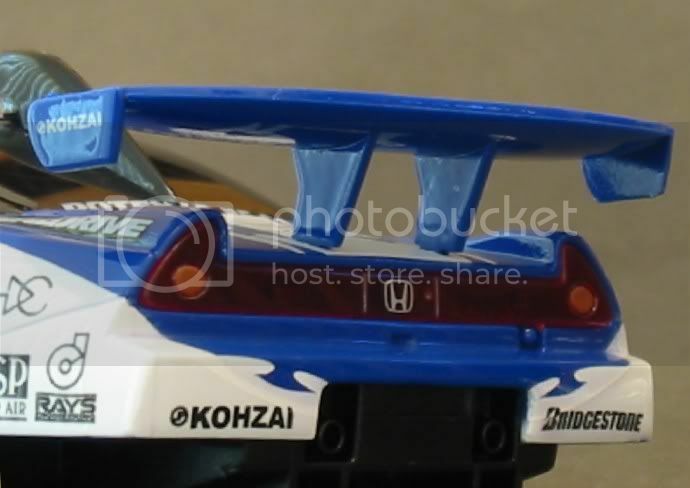 But I have bought it to contest a local JGTC NON MAGNET series! What have I let myself in for?? So while the body is off, I have poked out the magnet, there, that’s done it now! Racing will e conducted on Red racer Hobbies “Red Raceway’ We can contest with Ninco NC5’s or Scaleys with the 20,000 motor upgrade. Have I made the right choice, time will tell. So, with all that behind us we can move on to the track. Even though most of you don’t need reminding I will run it past you again. Ninco make fast cars, no one can deny that, but the problems start when the straights run out!! On their home track they can put up a reasonable amount of competition but on all other makes (that I’ve tried anyway) they slowly start to loose the plot. The stumbling point is the mid mounted magnet. Scalextric have the drop on them and on all but the fastest of tracks it should not be hard to get a Scaley to out manoeuvre a Ninco car, true! The more slippy the track surface, the worse it gets and if you are racing on Carrera track expect disappointment. In fast corners this model gives the impression that it is going to do the business but if pushed, at the last minute, it will step out and valuable tenths will be lost if you stay in the slot. 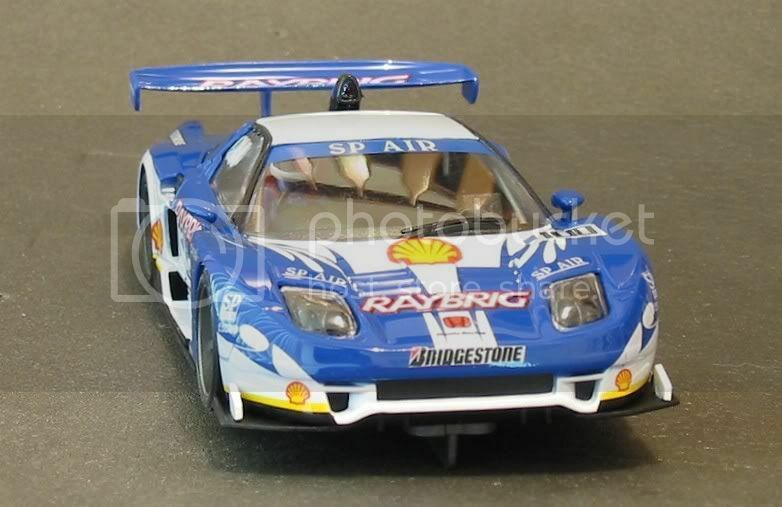 It isn’t a sudden ‘off’ like a Scalextric or an SCX car. You can almost sense it coming to the point that you do have time to back off and save the situation. Almost a psychic link!! 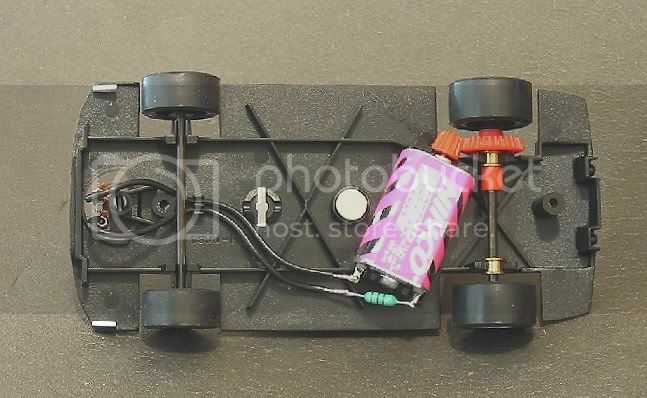 Board track / non magnet racing. Now this is a different kettle of fish! Ninco love board track! Once the motor is glued in, tyres are trued and treated, axles are secured and the rear chassis is braced you will be uncatchable in the 20,000 rpm motor range. The long arm motor delivers its power smoothly and controllably unlike the shorter ‘S’ can Mabuchi who’s power come in with a sting. Corner exits and straight line acceleration are impressive, even with the original rubber on the back. The car has a low C of G and uses this well. On non magnet plastic track racing, a good tyre selection will see the model deliver. All in all and with the addition of a little ballast to take it up into the 90 gram bracket this model is a pleasure to drive. The back stays put in the quickest of bends and there is no fierce ‘tail wagging’ even when you are being pressed hard. I have spent some time with mine, non magnet, on Carrera track for the purpose of the up coming races. I have introduced a modest amount of weight to the model and firmed up the front end. The motor has been well glued in with hot glue and in the process I have stiffened up the rear end. On initially running the model I was pleased with its behaviour although on one banked bend it persistently went straight on if I hit it too hard. I attribute this to the front of the model lifting the guide out of the slot on the banking and have taken measures to overcome this. The motor works better with use and it is getting to the point where it is singing. The gears were provisionally a bit whiney but after treating them with a couple of applications of Tamiya fine polishing compound it is now probably one of the quietist Ninco angle winders I have driven! The only disappointment I had after 30 minutes running was that the model was involved in a ‘T’ bone deslot where another model hit it fair and squarely in the side. This resulted in a section of rim breaking away from the left hand rear wheel. The bulk of the wheel is intact and hopefully it won’t affect the wheel / tyre concentricity. As you might have probably guessed by now I am not Ninco’s number one fan. Primarily because they aren’t turning out what to me should be desirable models. Yes, they are doing the latest models in several fields but I always feel they have either picked the wrong model or the wrong livery. Never mind but I will be the first to admit that when it comes to competition, on board track and non magnet racing, they have to be considered first! Why, because they are so damn good on it! Simple as that! I very recently got this model out again and dusted it off for a local race. Running on the original tyres on a technical board track I managed to bring it home first out of fifteen racers. The trick was to drive at a steady but fast pace staying clear of trouble. My average lap times were only two or three tenths slower than my fastest lap (about 11.00 secs) Although there were several quicker cars in the race, its ease of driving minimised the risk of forced errors. The race was made up of Scaley, Ninco and Carrera JGTC's. 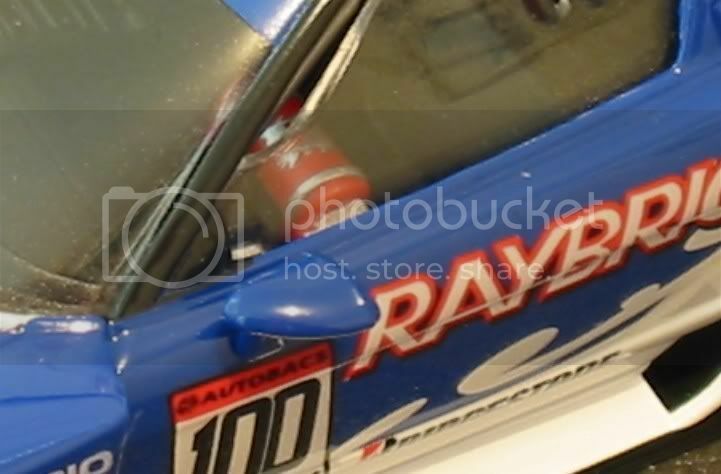 I have been racing this model for more than several years now in non magnet JGTC class and more recently it has shown signs of race fatigue and has been a bit off the pace. Not being sure why this should be I gave the model the once over and tidied it up a bit. Main issue was the rear hubs had split on more than one occasion and had been repaired and glued also more than once. With expense not an issue I replaced both rear hubs with alloys and went to lengths to ensure they had inserts. A new pair of MJK urethane tyres to finish off and off to racing on the North side of Brisbane! Another issue which reared its ugly head was the pinion and spur gears. While resting on the shelf for a period, the pinion had split along a tooth valley and running it also caused the spur to be damaged; a couple of direct repacement Slot.it gears were fitted and run in. I was particularly impressed by the 'whisper' of the gear mesh, with several people also mentioning how quiet the model was. After some well spent practice time on all lanes to famiiarise myself with the track it was time to race. First up was Gp1 Touring cars and after one heat with my deep guide bouncing out of the slot I had to be content with third place. Next up was the JGTC class and the rebuilt Raybrig Honda was placed on the start line. Green light on and the model was off the start line like a cut cat and so it was for the rest of the heat, and for the three succesive heats! Finally with results published the car had come to a comfortable first place in a field of fourteen and stayed intact! Not bad for a model which is more than ten years old and has been competetively raced four or five times most! The moral is that if you had a model that was once a regular race winner and is now a bit off the pace, all it probably needs is a bit of TLC to return it to its former glory! Give it a go.